LIKE MOST of you reading this article, I was born in the twentieth century. I learned twentieth-century English, but the Bible I use is written in seventeenth-century English. The archaic seventeenth-century language is a basic problem with the King James Version. Granted, there are other translations available if I wanted to get away from the old English, but many of them have their drawbacks — even more than the King James Version. Most modern translations have relied upon Greek texts other than the ones used by the King James translators. By relying on other texts, modern translators tend to leave out certain sections contained in the King James Version, or put them in hard to read footnotes at the bottom of a page or at the end of a chapter. One outstanding example is the section describing the woman taken in adultery (John 7:53-8:11). This account is deleted from the text generally used by modern translators. In such cases I would much rather have the entire text translated, with any doubts about its authenticity expressed in a footnote. Then I could do my, own editing rather than someone else doing it for me. Maybe I'm asking too much of the translators. All I basically want is a King James Version in modern English. Well, the translators of The New International Version (presently only available in the New Testament — the Old Testament is scheduled to be finished in 1976) have come to my rescue. The New International Version (NIV) is billed as the first translation made by a group of conservative theologians of various national and religious backgrounds. "The fact that participants from the United States, Canada, England, Australia and New Zealand are working together gives the project its international scope. That they came from various denominations, including Baptist, Brethren, Church of Christ, Episcopalian, Lutheran, Mennonite, Methodist, Nazarene, Presbyterian, and Reformed churches, safeguards it from sectarian bias" (preface to The New International Version, p. vii). Though these conservative scholars used the text generally accepted by the other modern translators, they have kept some of the sections that most modern translators delete. In the case of the woman taken in adultery, mentioned above, the NIV sets it off with lines, but leaves it in the same size type as the rest of the text. A footnote explains that the older manuscripts do not contain the passage. However, the NIV does not consistently use this approach; the translators do put shorter phrases or sentences in footnotes where their text differs from the King James. Still, the NIV reads basically like the King James with updated language and idiom in most places. I found that I could easily follow a speaker in the NIV if he were using the King James. Another important thing in the NIV's favor is my wife's opinion that it is much easier for our children to understand. She prefers it to The Living Bible. The NIV translators have dropped the formal "thee" and "thou" when referring to God or Christ, making the translation much more readable. The translators recognize that there is nothing "holy" about using these formal pronouns when referring to God. Another thing the NIV has going for it is that it is not printed in the traditional two-column format, but in a large-print single-column format that makes it much easier on the eyes. It reads more like a good novel than a heavy textbook. Even though it has all these things in its favor, I personally doubt if the NIV will be accepted in some circles because its use of more modern English will tend to eliminate certain "key" words or phrases upon which some have based their doctrines or ideas. But rather than cause a problem in such cases, I feel that the NIV can rather serve to illustrate that ideas and doctrines should not be built on one word or phrase in a particular translation. All of this may sound fine, but so far it is only a layman's opinion. What do the qualified experts say about the NIV? 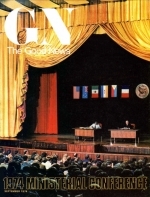 In the April 1974 edition of Eternity magazine, a group of eight qualified biblical scholars evaluated nine of the most popular versions of the Bible. The NIV was included in their evaluations. One of the scholars did not have the time for a proper evaluation of the NIV, but the other seven seemed to be quite pleased with it. The major complaints were with the way the book was bound rather than the quality of the translation. It was the general opinion of the scholars that the translators could have done a little more in their modernization of the language. In the words of F. F. Bruce (professor of biblical criticism and exegesis at the University of Manchester, England) the NIV is: "An admirable version, combining fidelity to the New Testament text with sensitivity to modern usage. The avowedly conservative stand of the translators has not resulted in any bias in their work; it has rather enhanced the sense of responsibility with which they have undertaken their task" (Eternity, April 1974, p. 28). The NIV is published in hardback by Zondervan Bible Publishers, Grand Rapids, Michigan, and is generally available in Bible bookstores.